The sun is finally shining on the Denver real estate market, literally. Zocalo Community Development (ZCD) has been featured as an innovator for its mortgage program at RiverClay Condominiums: a program that is boosting sales by offering homebuyers lower interest rates if they elect to buy condominiums equipped with solar panels. ZCD has been included in Environmental Defense Fund’s annual report on business innovation, as one of 15 businesses cited nationally (including big names such as Cisco Systems, Coca-Cola, Google, Intel and Wal-Mart). Zocalo Community Development feels extremely honored by the recognition and we couldn’t be happier to see their incredible work noticed on a national level. 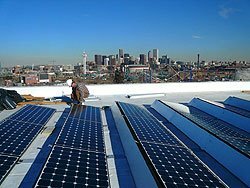 They have been a leader in sustainable development in Denver, building the first LEED-certified condominiums in the Rocky Mountain Region and are continually looking for new ways to push the green movement even further. Lullaby For Columbine A Networking Event You’ll WANT to Attend!